Independence of Cartagena Day commemorates 11 November 1811 when Cartagena was the first Colombian city to declare freedom from Spain. It will usually occur November 11th unless that date doesn't fall on a Monday, then it would be the upcoming Monday. Originally the holiday was celebrated with solemn speeches and memorials for those who ended their lives for the cause. More modernly the people of Colombia have started parades and beauty pageant's to celebrate the importance of that day. 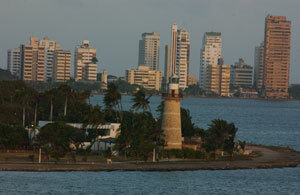 The city of Cartagena was named after a similar city in Spain when the Spanish settled it in 1533. In the 18th century many Colombian cities were ready for independence and after the first declaration was led by the city Boyacá, Cartagena followed.